It’s citrus season! Winter may not have much to brag about from a seasonal produce perspective, but boy is the citrus good this time of year. 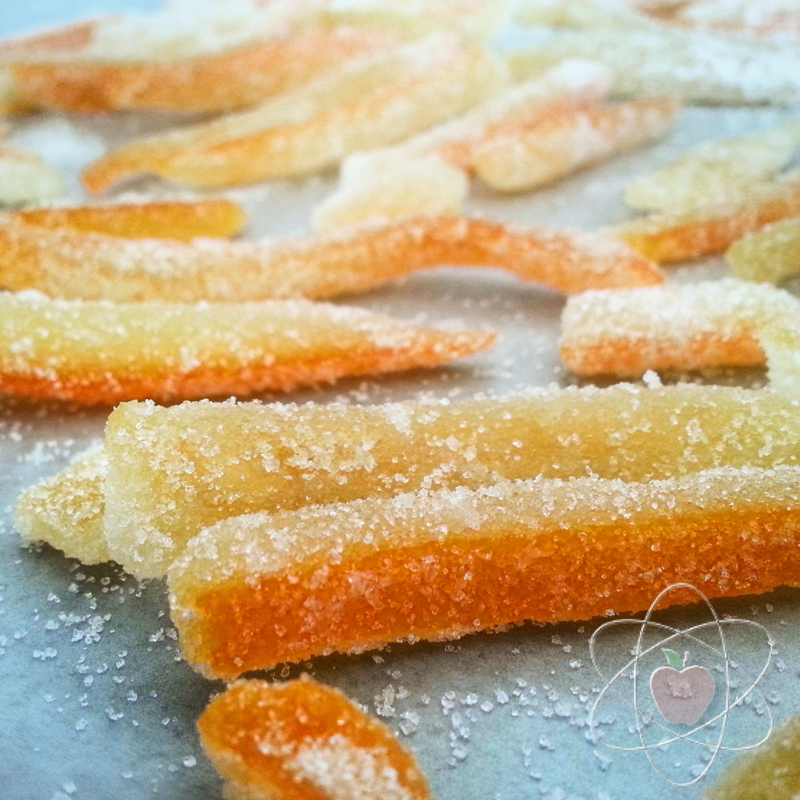 To help make the most of the season, I decided to candy some citrus peel. It’s easy to do, makes quite a lot of candy per fruit. A typical batch makes enough for your own sweet tooth plus extra to give away as gifts. I used four or five oranges and three lemons, and I had several trays of candy laying out to dry by the time I was done. I’ve created the recipe below to be flexible to any batch size. Instead of giving specific numbers, all the quantities are based on how much citrus peel you’re starting with. So whether you have one orange or ten, this method will work. Any type of citrus will do, but if you want to make these for snacking, I recommend using mostly orange peel, which is sweet and thick-skinned. I also recommend dipping these in chocolate if you like a bit more complexity in your candy. In addition to snacking, candied citrus is delightful chopped into scones and cakes, and makes an excellent garnish for cocktails. In fact, you can save the leftover sugar syrup from this recipe and use it to sweeten tea or cocktails. Wash and peel your fruit. For a clean edge, use a knife. Pictured below is a step by step guide on breaking down citrus with a knife. Make sure you get as much of the peel off as you can, including the white pith (it’ll be the best part once we’re done with it!) Now slice each piece of peel into strips, making sure each strip has some colorful zest. Transfer the peels into a pot and cover with water. Bring to a boil and cook for 10 minutes. Drain and repeat two more times. Blanching them three times helps remove most of the bitterness and softens the peel, which allows the syrup to permeate it in the next step. To keep things moving, I recommend getting the next batch of water boiling while the previous batch is cooking. Add your peels back to the pot and count how many cups it takes to cover them with water. Add the same number of cups of sugar. 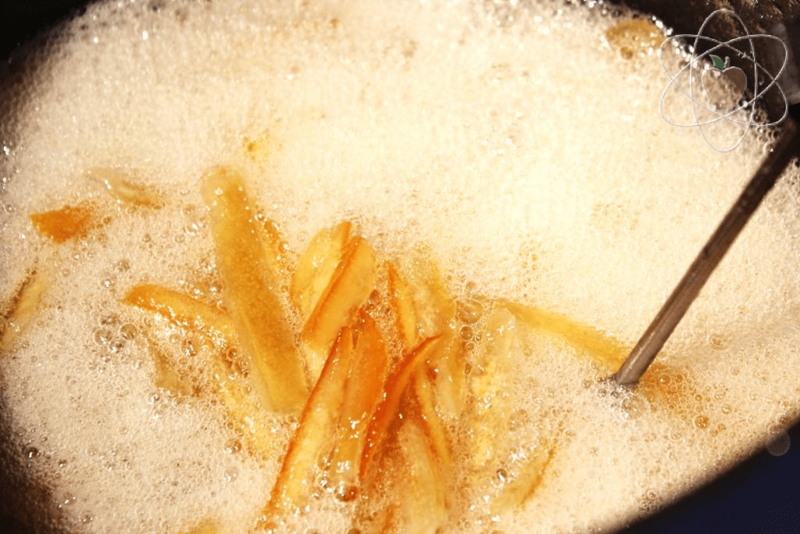 For example, if it takes four cups to cover your peels, then add four cups of sugar. Stir and bring to a boil over high heat. Cook, stirring occasionally, until the mixture reads 230F on your digital (or candy) thermometer. While that cooks, line a cookie sheet and place a greased wire rack on top. Remove the pot from the heat and transfer the peels to the greased wire rack, separating them a bit with a fork so the excess syrup can drain as they cool. Meanwhile, fill a large dish with about a half inch of sugar. Once your peels are cool enough to handle, move them to the pan of sugar and roll to coat. Make sure to separate any that are stuck together. Separate each piece and lay them out on a sheet tray lined with wax or parchment paper to dry for a few hours. They’re done when they’re firm to the touch. Depending on where you live, this could take a couple hours, or it could take overnight. Once they’re ready, store them in an airtight container. Another way to take advantage of a good crop of citrus is to remove the zest from the entire fruit with a vegetable peeler and freeze it. I also made some spiced orange jelly with this season’s citrus haul. That recipe is coming soon! Thank you for this recipe!…have been searching for years to find a trustworthy version. Your details made me an immediate fan. Kudos! These look great! And super yummy! 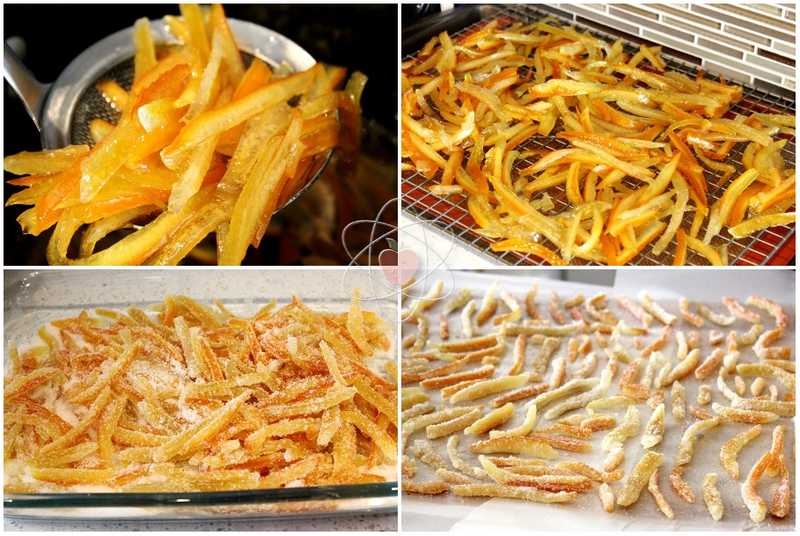 How long can you store the candied fruit for? They’re best eaten within a few weeks, because they tend to dry out and get a little tough after long storage times. However, they should never actually spoil or mold, so they’re safe to eat indefinitely.